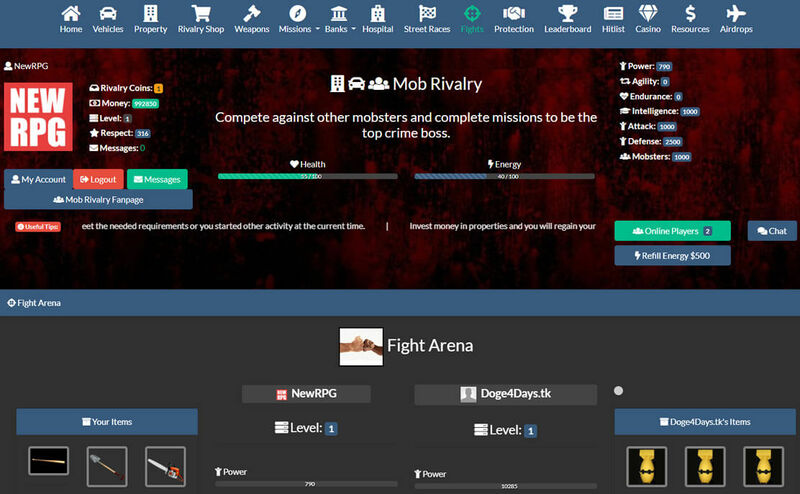 Mob Rivalry is a modern (also mobile friendly) level-based mobster game. Make your mobster stronger and buy advanced military equipment. Start taking down enemies from Hitlist and earn respect. Buy a property and a vehicle, upgrade your vehicle to win some races against other players. Fight Arena is a great place to test your strength. Do missions to gain more money and experience, there are various mission types. Keep an eye on the game’s unique feature called “Airdrop program” for free coins. This game definitely has potential. The graphics are very Old school and the pages load very slowly, so be patient. Other downsides are profits for property have to be manually collected at the various times and are not automatic (so if you are not there, your mob won’t collect your profits for you), Health and Energy don’t have a natural regeneration (everything has a price), missions have a very limited selection and some don’t have missions at all, the races and fight system doesn’t remember who you have recently fought so you constantly encounter players you can no longer fight/race, there is also no Tutorial so you just have to dive in and figure things out as you go. Besides that, this is a very entertaining game and I will enjoy playing it day in and day out. Love the game it is for sure going to be a big hit out of beta. That airdrop is a system utilized with cryptocurrency and a first to be seen in the browser based gaming world. It combines the best of both worlds within browser gaming. Very brilliant ideas and from what I am told there are many more to come. They even have the start tot here own social network for the games they will be releasing with these methods.